.. "Stop Sniffing My Bum!". Very apt because all of Mr. B. 's family are people who like to sniff baby's bottoms (!!!) I guess it's a bit like sniffing their heads... only with a very different outcome! 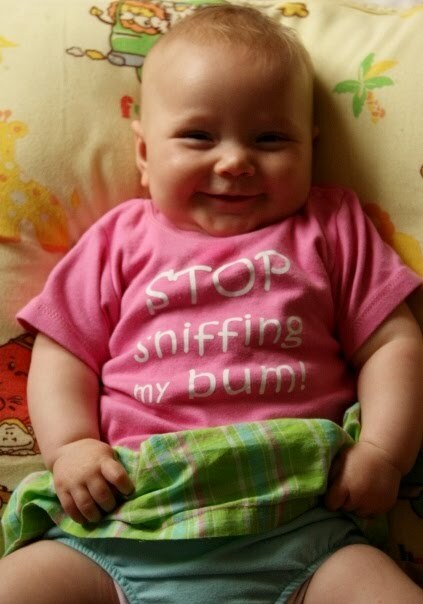 Cheeky Baby Tees sell some very simple t-shirts and bibs but with fun slogans - you can even choose your own text. Some of my favourite slogans include "Daddy's gadgets are my toys", "If it sparkles, I want it" and "If you think I'm cute, you should see my daddy". T-shirts are available from 3 months all the way upto 5 years old and there are a few of them that would be very apt for Lara right now ("I'm not scared of the naughty step). The T-shirt is a nice thick jersey knit of cotton and has survived the wash well. Holly's is the smallest size and it comes with two poppers on the shoulder to make it easier to take off. I will admit that at just £7.99 I was expecting a lower quality as the images of the prints on the website didn't look very sophisticated but I was proven wrong when it arrived. Cheeky Baby Tees also have a very small range of baby body suits (I wish they did more) and their bibs are nothing fancy but with personalised, cute or funny slogans they would make a great gift for under a fiver. It is also worth knowing that they make big sister and big brother t-shirts which are great for older siblings as a gift when a new baby arrives. Cheeky Baby Tees are offering a 15% discount off your first order if you use the code MELLOW15.